Havan being performed to celebrate Foundation Day of Shrine Board at Katra. 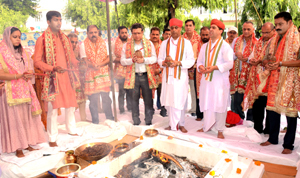 KATRA, Aug 30: Performing of Pooja, Havan, Yagya and organizing several other events marked the celebration of 33rd Foundation Day of Shri Mata Vaishno Devi Shrine Board today. 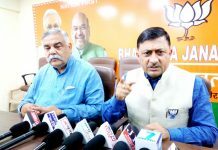 These functions were organized at Bhawan, Adhkuwari, Katra, Vaishnavi Dham, Jammu and other locations in which the staff of the Shrine Board and a large number of pilgrims participated. At the culmination of these functions, Prasad was distributed among the pilgrims by the senior most officers of the respective areas and units of the Shrine Board. Employees of the Shrine Board took pledge on this occasion to perform their duties with sincerity and devotion. At Katra, the main function was held at Niharika complex where special Pooja and Havan was performed. Anshul Garg, Additional Chief Executive Officer; Dr Arvind Karwani, Dy CEO; and other officers and staff of the Shrine Board, besides the pilgrims participated. It was followed by distribution of Prasad.